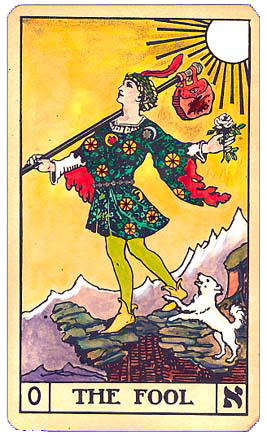 The Fool represents the passion and purity of purpose found in all beginnings. Cloaked in trust and innocence, he teaches us to look up and reminds us to act on our ideals. He is symbolic of life and breath, fire, and air, the figure of Divine Energy. He radiates vitality and promises the grand adventure. The archetype of Eternal Youth, he is Every Human on the path of life. Confer with The Fool at the beginning of anything new. The Fool image on journals, T-shirts, and mugs. Affirm: I Radiate Love, Life, and Light.